Custom Repeaters allow you to fully customize a list. Whether it be links in a Link Group for horizontal/vertical navigation, or lists of categories in unique styles. The Custom Repeater is used when you need complete control over the styling of link groups or a list of categories. Note: This does not mean that simple design requirements cannot be achieved through the Customer Repeater Widget. The point of the Custom Repeater is to give you direct control over each element in the list as quick as possible. There are two types of customer repeater widgets. Custom Repeater (Browse by Category) - an alernative way to using the Browse by Category widget. Use it to list categories. 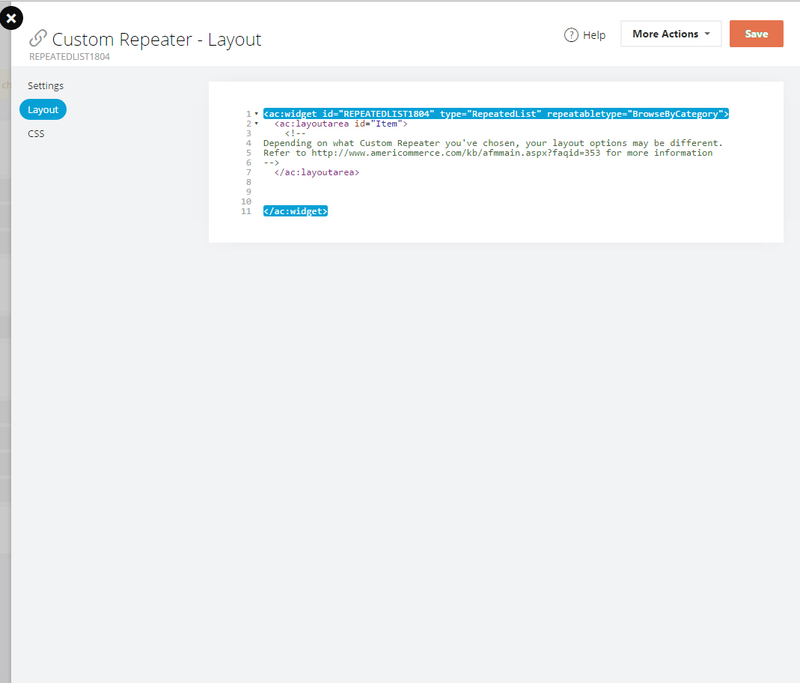 Custom Repeater (Link Group) - used to display Link Groups created in Site Explorer. Handy for creating advance-design vertical or horizontal navigations. The Custom Repeater has two elements that can be customized at a root level. 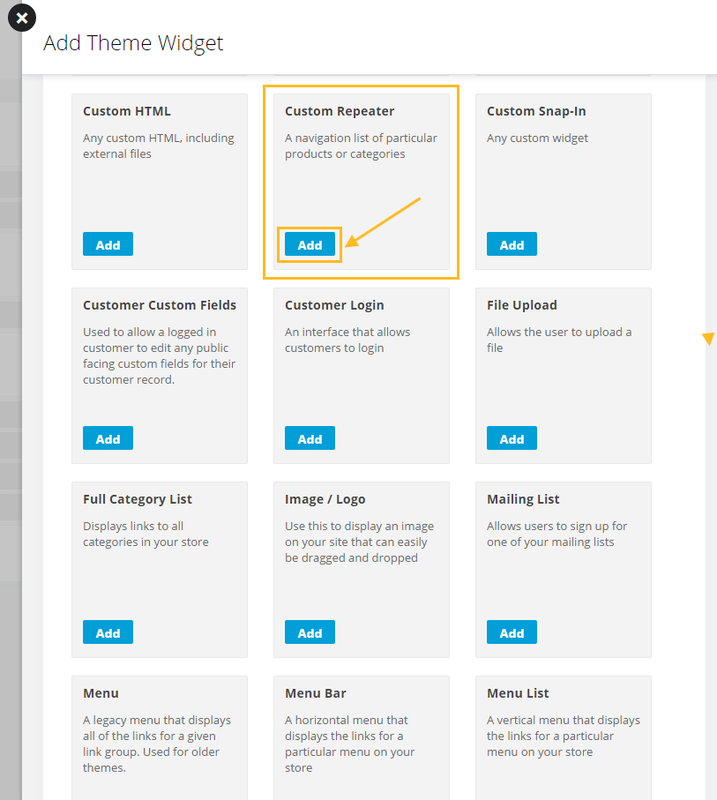 Widget - Styling and layout setting specified for the widget itself apply to the entire Customer Repeater widget and its contents. For example, overall width/height, background image, float right/left, etc. Item - Styling and layout settings for this element apply to the links within that widget. These widgets are alternatives for the Browse by Category and Link Group widgets. They perform the same basic function but the customer repeater allows for design controls beyond those provided in the Browser by Category Widget. The following Merge Codes are available for use in this Widget. $$REPEATER$$ - This merge code applies to both, Browse by Category and Link Group, widgets and is used in the widget design area. Note: This is required to repeat the list of links in the widget. Within the widget the various links are comprised of the following merge codes. You can either use the overall design paramters for the widget or further customize their appearance using CSS and/or other layout controls. There are number of possibilities with the Custom Repeater. The following example is provided just as an idea of what the customer repeater can accomplish that is not easily possible by using the default Link Group and Browse by Category widgets. The same controls can be extended/modified/replaced to suit nearly any design requirement. The following example shows how to use advanced CSS controls to create rounded-corner highlights in a horizontal navigation. 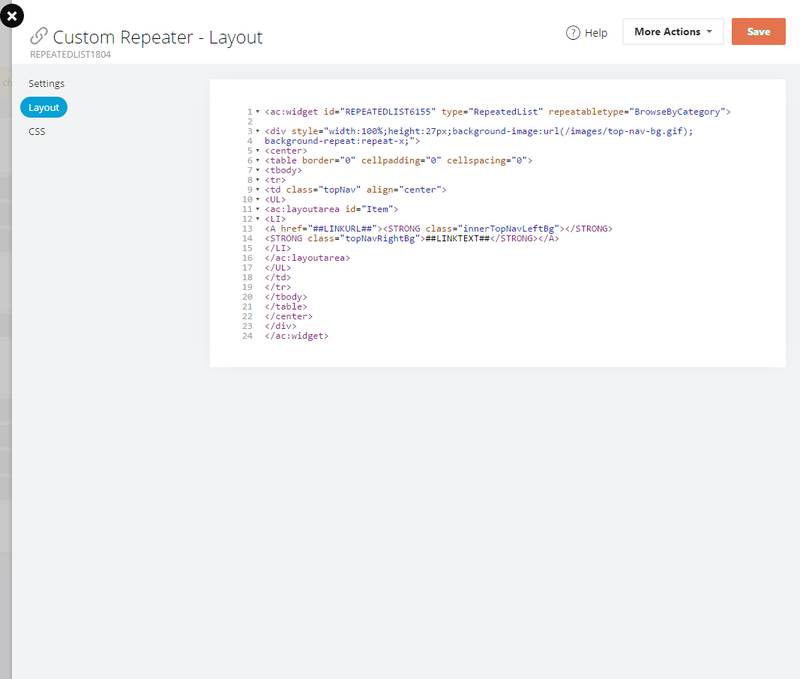 Browse to Themes > ActiveTheme > Header > Widgets : Click and drag the “Custom Repeater” to the widgets area. Custom Repeaters allow you to fully customize a list. Whether it be links in a Link Group for horizontal/vertical navigation, or lists of categories in unique styles. The Custom Repeater can be used when you need complete control over the styling of link groups or a list of categories. Note: This does not mean that simple design requirements cannot be achieved through the Customer Repeater Widget. The point of the Custom Repeater is to give you direct control over each and every element in the list as quickly and conveniently as possible. Widget - Styling and layout setting specified for the widget itself apply to the entire Customer Repeater widget and its contents (for example, overall width/height, background image, float right/left, etc.). These widgets are alternatives for the Browse by Category and Link Group widgets. They perform the same basic function but the customer repeater allows for design controls beyond those provided in the Browse by Category Widget. The following Merge Codes are available for use in this Widget. Within the widget the various links are comprised of the following merge codes. You can use the design paramters for the widget or further customize their appearance using CSS and/or other layout controls.. There are number of possibilities with the Custom Repeater. The following example provides an idea of what the customer repeater can accomplish. This is not easily possible by using the default Link Group and Browse by Category widgets. The same controls can be extended/modified/replaced to suit nearly any design requirement. Browse to Themes > ActiveTheme > Header > Widgets. 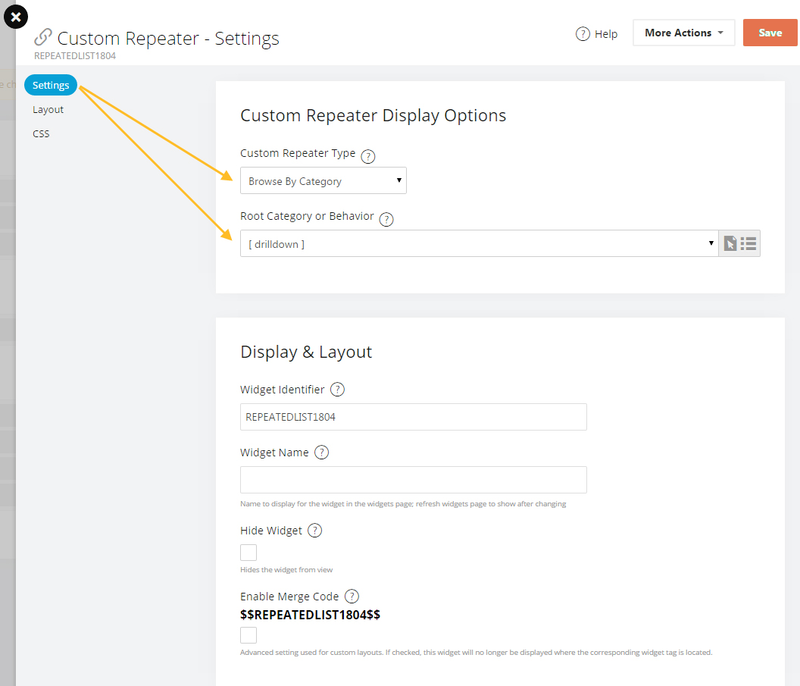 Here, click and drag the “Custom Repeater” to the widgets area. Click the Edit Widgets icon and set the “Custom Repeater Type” to Menu. Similarly, you can use the Custom Repeater widget along with your own layout and CSS stylings to create category and link group listing designs as per your requirement.